This document provides an introduction to Ajax and demonstrates some of the features in the NetBeans IDE that allow you to program faster and more efficiently when working with Ajax-related technologies. While learning about the low-level functionality of Ajax, you build a simple application that employs auto-completion in a text field. Content here has been adapted from Greg Murray’s article and sample application from Using Ajax with Java Technology. If you need to compare your project with a working solution, you can download the sample application. 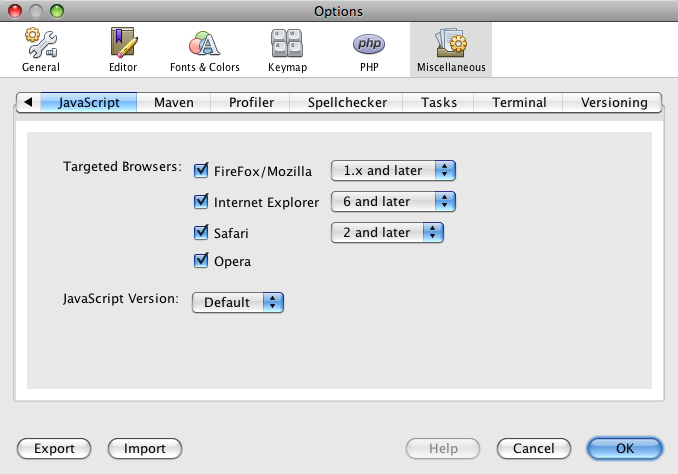 Use the IDE’s New Project wizard (Ctrl-Shift-N; ⌘-Shift-N on Mac), and select the PHP with Existing Sources project type. In the wizard, point to the downloaded sources on your computer. In Step 3: Run Configuration, specify how you want to deploy your application. If you have set up your PHP development environment by configuring an AMP package, you should select *Local Web Site from the drop-down list, and specify the URL of the project, as it will appear in a browser. 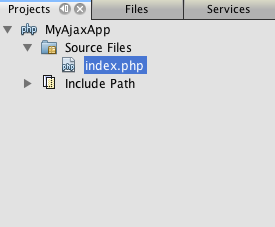 A default index.php index page is generated and opens in the IDE’s editor. Also, your project appears in the Projects window. If you have difficulty setting up your project or establishing communication between the IDE, the server and browser, see Setting Up a PHP Project for a more thorough description. The PHP Learning Trail can provide more information on configuring your environment. Now that you are certain your environment is set up correctly, begin by developing the auto-complete interface that will be viewed by users. 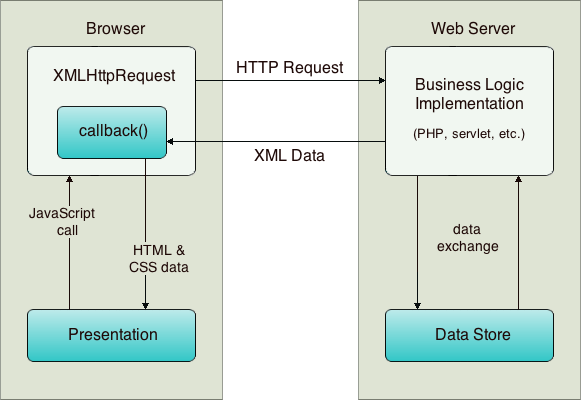 Because the index page that we’ll create does not require any server-side scripting elements, start by creating an HTML page and setting it as the entry point for the application. A second feature you can make use of is the IDE’s Palette. The Palette provides easy-to-use templates for elements that are commonly applied in the technology you are coding in. You simply click on an item, and drag it to a location in the file open in the Source Editor. The NetBeans IDE provides comprehensive support for web development using PHP. You can set up your development environment using an *AMP package, enabling you to edit and deploy from the IDE quickly and efficiently. The IDE allows you to configure your environment with a local server, as well as remotely, using FTP or SFTP. You can also configure an external debugger, such as Xdebug, and set up unit testing with PHPUnit from the IDE’s PHP Options window (Choose Tools > Options; NetBeans > Preferences on Mac, then select the PHP tab.) The PHP editor provides standard editing features such as code completion, syntax highlighting, mark occurrences, refactoring, code templates, documentation pop-up, code navigation, editor warnings and, for NetBeans 6.9, error badges for malformed syntax. See the NetBeans Video Tutorials and Demos page for screencasts on PHP support. Name the class ComposerData, and click Finish. The class is created and opens in the IDE’s editor. Replace the file’s existing code with the following script. *Note: * The file composerView.php is not described in this tutorial. You may create such a file to see the final result of the search. A sample of the file is included in the sample application. You must define the callback function to handle the server’s response, and add any functionality necessary to reflect changes in the page that is viewed by the user. This requires modifying the HTML DOM. Finally, you can work in the IDE’s CSS Editor to add a simple stylesheet to the presentation. Notice that the parseMessages() function is called only when the XMLHttpRequest.readyState is "4" and the status — the HTTP status code definition of the request — is "200", signifying a success. You will define parseMessages() next in Updating the HTML DOM. The functions and elements that you create in the following steps work interdependently. It is recommended that you work through this section, then examine the code once it is all in place. One purpose of init() is to make elements inside index.html accessible to other functions that will modify the index page’s DOM. 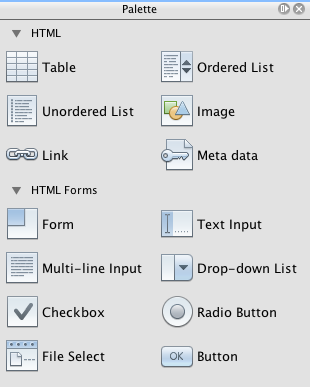 Above, the script creates a new HTML table, adds the popupBox class and modifies the element’s style to display: none. Finally, it gets the element whose id is auto-row and inserts the new table into it. In other words, the modified HTML looks as follows when the code is run. See this explanation of offset on http://www.quirksmode.org/. NetBeans 6.9 provides Rename Refactoring and Find Usages support. This support is available not only in css files, but in all files containing embedded CSS code (e.g., HTML, PHP). CSS classes, id’s and type elements can be refactored in all project files. To make use of this refactoring support, press Ctrl-R on a given CSS element and use the provided dialog to perform the rename action. You can also preview changes before performing the rename action. To utilize Find Usages support, right-click a CSS element and choose Find Usages. See NewAndNoteworthy69m1 for more details. Click Finish. The new file is added to the Projects window, and opens in the IDE’s editor. In stylesheet.css, type in the following rules. You can make use of the IDE’s code completion support by pressing Ctrl-Space at points when you want to call up suggestions. 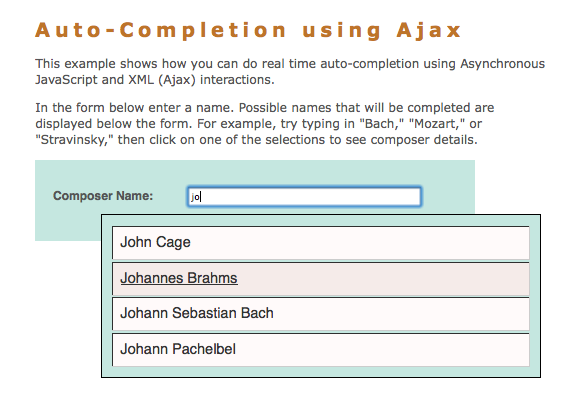 You may note that the application you built has numerous shortcomings, for example, nothing happens when a composer name is selected from the auto-complete box! You are welcome to download the sample application to see how this can be implemented using PHP technology. Furthermore, you might want to investigate validation that prevents a user from requesting a name that does not exist in the data store.